Fort Story is a truly hidden gem north of the Virginia Beach strip. Located on an active Army base, it's not well-known to tourists...but we're sharing the secret with you! Visit the old and new Cape Henry lighthouses, view old military vehicles, chase crabs, and enjoy having a beach practically to yourself. And it's free! The fort is unique because it is the US Army's only training grounds for "logistics over the shore operations" which allow them to train Army members how to use amphibious (going from water to land) equipment and show them how to transfer military cargo from ships to land. You may find it particularly interesting because you'll be able to visit a real, functioning military base, visit two historic lighthouses and a historic landing spot for the early colonists, and enjoy long stretches of practically deserted beaches with lots of sea life. The old Cape Henry Lighthouse overlooks the new one! To get there, from the resort strip, go north along Atlantic Avenue and you’ll hit this World War I era Army base, now part of Fort Eustis. Drive by old army buildings until you come to the First Landing Cross (site of where the Jamestown colonist made their “first landing” in America), and the Old Cape Henry Lighthouse which was commissioned by George Washington (if you want to go inside the lighthouse, you’ll need to come during the day). The Lighthouse cost a whopping $17,700 by the time it was completed in 1791, and was made with stones cut from the same quarry used to build the White House. You can climb the steep spiral staircase (it's a workout!) in the 75 foot tower and look out the windows for a superb view of Cape Henry and the new lighthouse. Be prepared to huff and puff up nearly 200 steps! 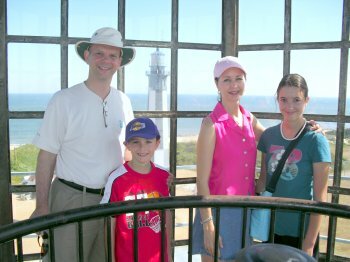 For details about visiting the Cape Henry Lighthouse, click here. One of our favorite things to do is take the kids to Chicks Crab House on Rudee Inlet for dinner, then pop over to let the kids run along the beach for awhile. It’s generally deserted, especially in the early evening...which makes it a perfect time for chasing the countless little ghost crabs that make holes in the sand. Sand-colored and almost transparent, they scuttle sideways to disappear from sight into their holes when you try to catch them. In the summer, you’re likely to see dolphins frolicking off the coast. Since this is an Army base, you’ll have to show your driver’s license and current car registration. 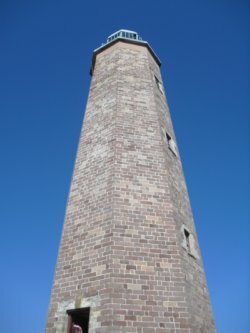 You can get on the base for free (tours of the Lighthouse have a charge). Hours are 5:30 am to 9 pm daily. During times of heightened security alerts, the base may be closed. Address: Shore Drive and Atlantic Avenue, Virginia Beach. Fort Story phone number: 757-422-7755.